A good clean room with proper service — that is the least one expects while staying in a hotel. But there are some unusual ones that go beyond one’s expectations and compel you to travel just to stay there. Lets discuss about some New Hotel Trends. Probably the ambience in a particular case, the services it offers, the views, or perhaps its very theme. A hotel in Kerala, for example, may be popular for its wellness programs, while one in Rajasthan for its heritage value. Various creative ideas of people across the world have translated into a range of unique hotels. These have created market for themselves and resulted in imitations in other parts of the world born from appreciation and admiration. This is No 1 New Hotel Trends in our List. Tribal s have used tree houses for ages, but of late these have emerged in the form of hotels in different parts of the world. 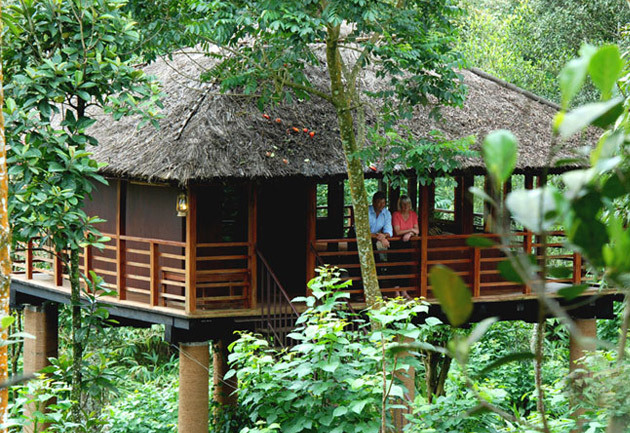 Germany, South Africa, USA, Vietnam and also India boast of tree house hotels. For various reasons tree-houses have caught the fancy of travelers. In India, one can find these types of hotels at quite a few places, particularly in the vicinity of jungles. This is more popular in the south Indian states of Tamil Nadu and Kerala where tree resorts like Green Magic Tree House Resort (Vythiri), Carmelia Haven Resort (Idukki), Tranquil Tree House Resort (Wynad), B-six Holiday Resort, and Safari Land Farm are in operation. Usually these tree resorts have regular kinds of rooms as well. The exteriors of these tree houses have a primitive look, but they are well-equipped with modern facilities such as electricity, telephones, television, running water and Western-style attached bathrooms. Rooms are furnished with bamboo beds, colorful sheets, blankets, carpets and a verandah is usually present. Prices range from Rs 4000 to 11,000 per night, depending on the facilities available. In a resort in Panna, Madhya Pradesh, for instance, a tree house costs nothing less than Rs 10,000 a night during peak tourist season. Its one of our favorite New Hotel Trends. Certain prehistoric dwellings, mines and caves have been converted into hotels in various parts of the world. The UK-based newspaper Independent has, in fact, made a list of five best cave hotels in the world. They include: Les Hautes Roches, Rochecorbon, France; Cappadocia Cave Suites, Turkey; The Caves, Jamaica; Alexander’s Santorini, Greece; and the Desert Cave Hotel, Australia. However, Cappadocia Cave Suites claims on its website that all its rooms incorporate original cave structures, cave bedrock, unique lighting, antiques and local handicrafts. Restoration works are ongoing and expected to finish later this year. Once completed, the hotel will have 38 suites. Desert Cave Hotel, on the other hand, has 19 underground suites to give people the experience of living in what used to be mines at one time. India has also many abandoned caves in the Deccan and Malwa plateaus, the Vindhyas, and the Aravalis. It remains to be seen if anyone is up to the challenge of constructing similar hotels, yet taking care not to disturb their historical significance. One of the New Hotel Trends and ideas to have hit the world, an aircraft hotel, is now operational in Stockholm. An abandoned Boeing 747 jet has been converted into a 25-room hotel at Arlanda Airport in the Swedish capital. This is a basic hotel, devoid of luxuries. It offers a 65 square feet room with a built-in platform bed, overhead luggage space, and a flat-screen television. Showers and toilets are shared, just as in any operational aircraft. There is, however, a reception to welcome guests and a cafe to serve food and beverages. This unique hotel has a conference room on the aircraft’s upper deck and a wedding suite in the cockpit. A 1950 Bristol Freighter, one of the last planes used by the Allied forces in Vietnam, has been fully refurbished into a two-unit hotel, rater motel, in Waitomo, New Zealand. Barry Woods, owner and designer of this hotel, says one of the two units, in the cockpit, can sleep up to four people. The tail unit of the plane can also sleep up to four people as it has a double bed and a set of bunks. A double bedroom is separated from the main area by a curtain. Bunks being slightly narrower than normal ones are more suitable for children, Woods says, though “Adults also do not mind sleeping in this,” he adds. Watching fish and other aquatic organisms in aquariums can be fascinating. But imagine what the view would be like from inside. New Hotel Trends of an underwater hotel provides just that. Though very few such hotels exist currently, a few others are under construction. The world’s first underwater hotel, the Jules’ Undersea Lodge, Florida, became operational in 1986. The entrance to the hotel is 21 feet below water level, and knowledge of scuba diving is a must to stay here. However, a crash course is available for newbies from the trainers employed by the hotel. Once inside, you can not only enjoy watching the marine life from your 42-inch window, but you can have other luxuries like air-conditioning, hot showers and DVD players. Similar hotels are coming up in Fiji, Dubai and Turkey as well. The one in Dubai is called Hydropolis and is expected to be functional by the end of this year. With a project cost, estimated at US $550 million, as reported by newspapers in the Gulf, the hotel will be a big one with as many as 220 rooms built at 66 feet below the surface. It will be different from the Jules’ Lodge in the design as the rooms are to be connected to the ground through a transparent train tunnel. The Fiji project, called Poseidon Undersea Resort, was expected to have been functional by 2008, but has been delayed and is expected to start operations in 2010. Maximum occupancy at this five-star undersea resort at a depth of 40 feet from the surface is 144. Rooms rents are expected to be around US $1500 a night, and the entire hotel can be booked for six nights, seven days for US $3 million. The Istanbul underwater hotel will probably also be operational by 2010 as well. 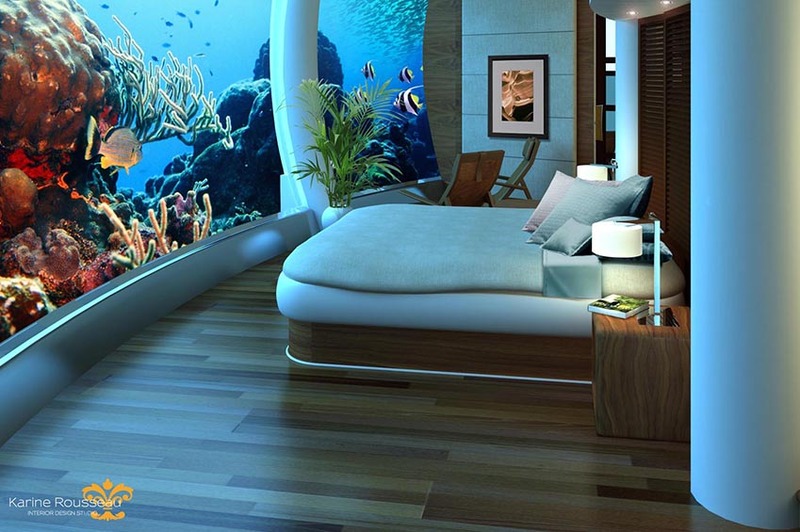 There are plans to build underwater hotels in places like London, New York, Munich, and Monaco. Obviously not all would be under the sea; some will be under the surface of river or lake. An underwater hotel in a lake called the Utter Inn has been operational in Vasteras, Sweden, since 2000. In this one-room inn guests can sleep 9 feet below the surface at 1 km from the banks. With a number of rivers and lakes, and a huge coastline in India, opportunities for such hotels seem immense. It is just a matter of time before some one takes the plunge. Ice hotels are quite unique new hotel trends in the very sense that they are temporary hotels made entirely of snow and ice blocks. They are, as the very name suggests, seen in the vicinity of the Arctic Circle. These are seen in winters in countries like Norway, Sweden, Canada and Finland.. A hotel is created every year with ice artists working on the ice blocks to create all sorts of sculptures. Even beds and glasses used by guests are made of ice. According to the information on the website of IceHotel the temperature inside the hotel is never less than -5°C to -8°C, regardless of the temperature outside. Ice hotels not only have rooms made out of snow and ice, they have provision for warm accommodation as well. After a stay of one night in the cold, you are encouraged to stay one or two nights in a warm room. Warm rooms are like normal hotel rooms built alongside cold ice rooms. Cold accommodation in IceHotel is available on a tariff of anything between US $145 and 785 per person on a twin-sharing basis. Warm accommodation, in contrast, is much cheaper, between US $163 and 205 per person on a twin-sharing basis. It is possible to build such hotels in India in regions that remain under snow for more than five months a year. Possibly in regions north of Badrinath in Uttarakhand and north of Rohtang Pass in Himachal Pradesh. There is an unusual hotel property in Berlin, Germany, called Propeller Island City Lodge, which is more like an art gallery than a hotel. The rooms are also not numbered, but have names like Flying Bed, Grandma’s, Padded Cell, Glass House, Freedom, Forest, Landscapes, Electric Wallpapers and Upside Down. There are altogether 31 rooms in the hotel, each with a rent of 79 to 115 Euros. Each room has its own special features. For instance, Grandma’s has its bathroom hidden in the wardrobe, and the items in the room are very old. The room called Space Cube, on the other hand, gives two persons the option to decide whether to sleep on the same bed or in separate beds. Depending on the decision, you can crank the illuminated barrier between the bed halves up or down. The most “normal” room in the hotel is the Electric Wallpaper. The hotel has its own gallery with lots of graphic and art works, where you can see and buy furniture and art created by Lars Stroschen, the person who took five years to create this artistic hotel. Helga’s Folly is another artistic boutique hotel situated in Kandy, Sri Lanka. The walls of the hotel are decorated with murals, framed photos, newspaper clippings, huge mirrors and various other articles. Helga, who owns the hotel, calls the property “ant-hotel”, has impressed her visitors so much so that one of her British guests composed a song in her honor and interestingly the song was on top of the charts in 2003. Room tariff ranges between US $145 and 240 a night. There is a hotel in Pondicherry managed by Neemrana Hotels with rooms having names, but they are not galleries of an artistic value. Perhaps, some day an Indian artist’s inspiration too will translate into a hotel like Helga’s or Lars Stroschen’s. There are a lot more New Hotel Trends and concepts coming up every day. .. Please visit this page frequently for latest updates.